Those of you who are tool-proficient will think nothing of this, but for this old granny, it was a major accomplishment and an adventure in using my new bag of power tools. A few months back, I bought a set of cordless power tools so I could dismantle my lovely redwood raised beds at the community garden. But I never got around to it and the garden committee did it for me. My new tools sat untouched. 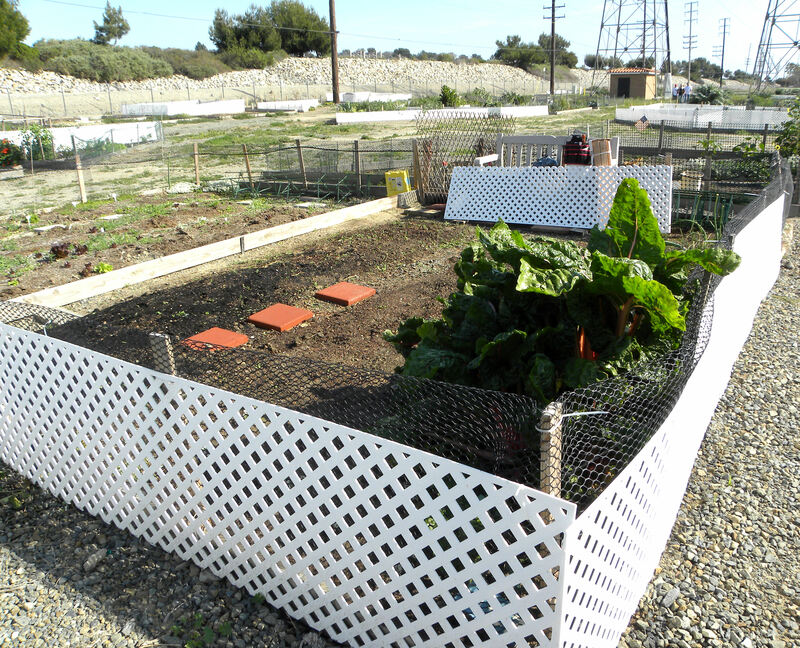 My plot at the Huntington Beach community garden had nice raised beds made of redwood. This shot was in November 2011, shortly before the beds were dismantled. 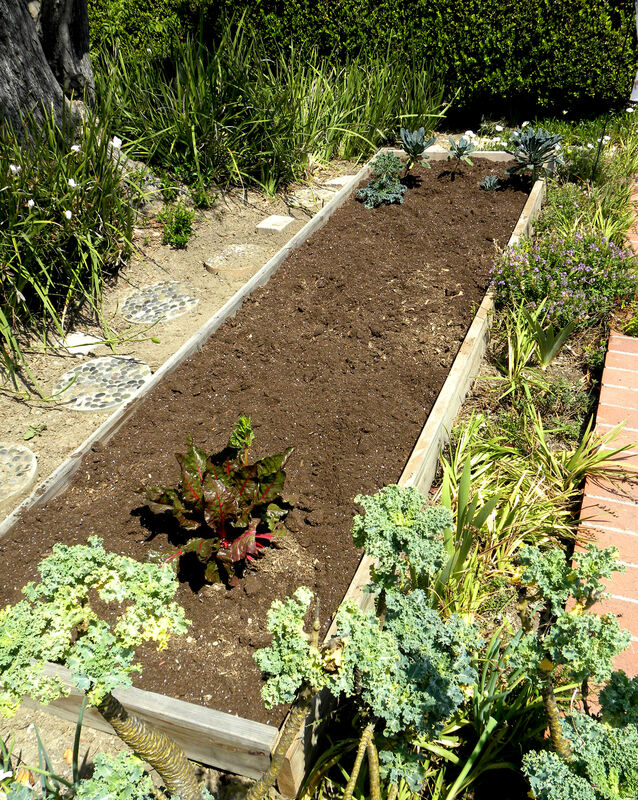 The reason why I had to remove my beautiful, one-year-old beds is that the landowner, Southern California Edison, disallowed raised beds. This has stifled my interest in gardening at the community garden so far this year. 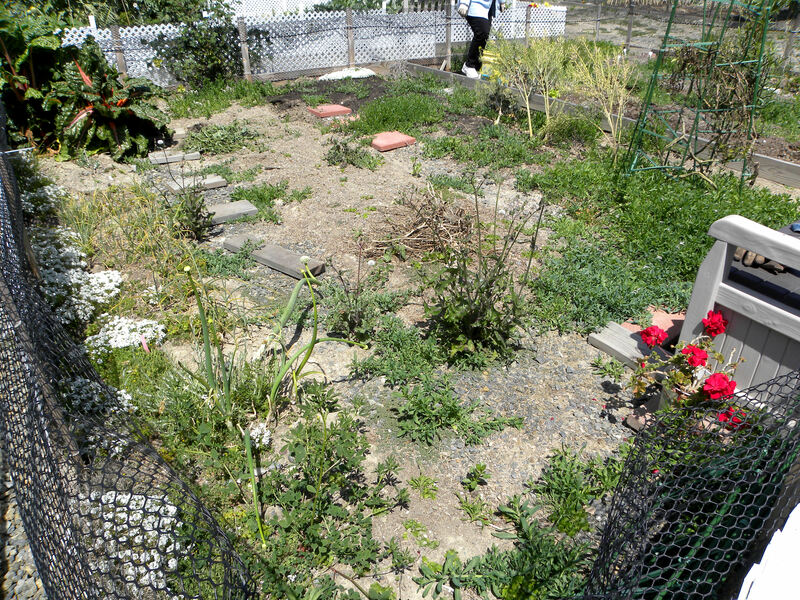 My poor neglected community garden plot, full of weeds, with no raised bed borders. This shot was in March. I weeded my plot, but so far haven’t planted it. I have plans to put in beans and winter squash, at the very least. But right now, all that is growing there is chard, onions, and garlic. The nice people on the garden committee even delivered the redwood boards to our home, because I don’t have a vehicle into which the boards would fit. My plan was to build a new raised bed where my Garden of Infinite Neglect sat in front, growing no vegetables. An aside–I work at the Orange County Conservation Corps. The exterior bed borders for our plots were built by my Corps Members last year, and those outer bed borders are allowed to remain. I swear, there is no rhyme nor reason to Edison’s rules, since my inner bed borders are exactly the same as the outer borders. I had watched my Corps Members build the borders and it didn’t look too hard. My husband built my raised beds at the community garden with a borrowed cordless drill, and I watched him too. I was pretty sure I could do this. 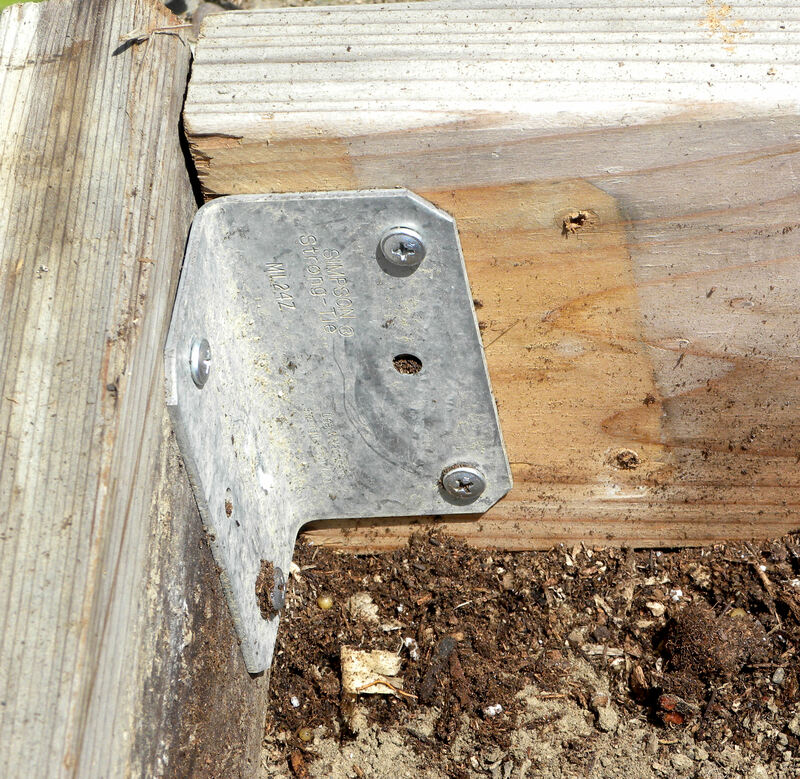 I had the corner brackets, the screws, and the redwood already cut into the proper length for me to build a bed in our front yard. And I had a nice cordless drill that I could use to put in the screws. Now you might be wondering about my last post on saving energy by making sun tea, juxtaposed with this post on using power tools. Hand tools are no longer an option for me because I’m pretty much crippled with arthritis in my hands and knees. I just don’t have the strength any more to put in a screw using a hand screwdriver. However, I was intimidated by my new drill. I had used a corded drill to both drill holes and put in screws, but never a cordless drill. Well, after reading some of Bee Girl’s posts about her Tool Girl, I decided that I could do it. So Tool Girl, even though we have never met, THANK YOU for your inspiration. Fortunately, my boards were already cut to lengths that I wanted. All I had to do was juxtapose the ends, bracing them with my foot, and drill in the screws. Piece of cake. You can see that these are reused boards by the old drill marks. My husband carried the heavy bags of compost to the raised bed and dumped them for me. 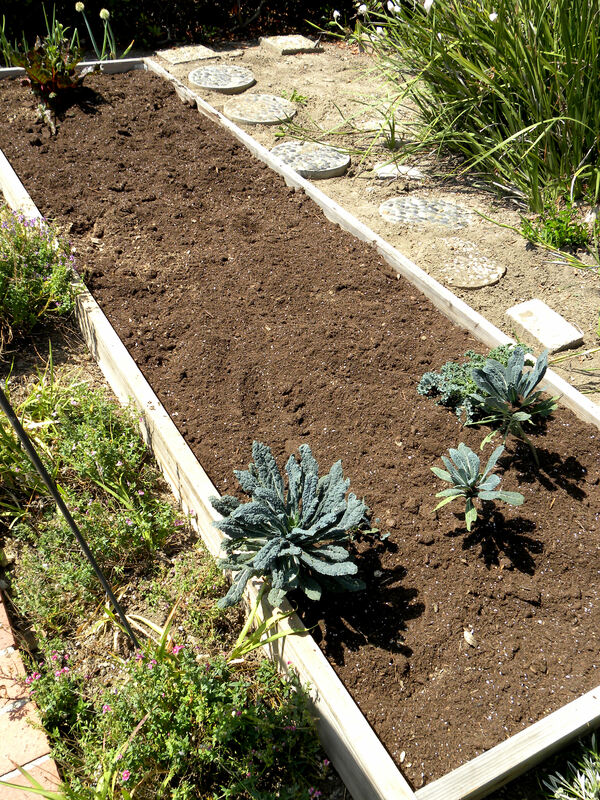 I filled the beds with a mixture of what Miracle-Gro calls organic garden soil (looked like sawdust and wood chips to me), potting soil, and steer manure, then dug it in well, mixing in dirt from below the bed. This bed is 12 ft long and 3 ft wide. This is the new bed looking from the other direction. The Lacinato and Scotch Blue-curled kale were left over from last year. Ditto the chard at the other end. I uprooted the rest of the chard and kale and fed it to my chickens. I drilled deck screws into the tops of the boards at one foot intervals, and threaded string around them to delineate foot square grids. I did this in part to facilitate square foot gardening, and in part (I hope) to discourage neighborhood cats from using my raised bed as a litter box. The cucumber trellises are from Gardeners Supply Company. I planted some almost-ready-to-harvest transplants of Red Sails lettuce and Joi Choy Pak Choy (the same as bok choy?). Being an impatient sort and having gotten a late start on the season, I planted basil, yellow crookneck and yellow straightneck summer squash, and butternut squash from transplants instead of seeds. I know, shame on me. Squash are so easy to grow from seeds. The marigolds are also transplants. I planted seeds of Tendergreen Burpless and Straight Eight cucumbers, Black-seeded Simpson lettuce, Scarlet Runner Beans, Lutz Greenleaf beets, Kyoto Red carrots, and Redhead radishes. I think that I planted some things too close together (like the summer squash), even though I have a string grid to go by. Oh well. I grow a Darwinian garden. Survival of the fittest. I still have a few more garden chores to do at home, and then I will tackle my community garden plot. Spring is still springing at our house. 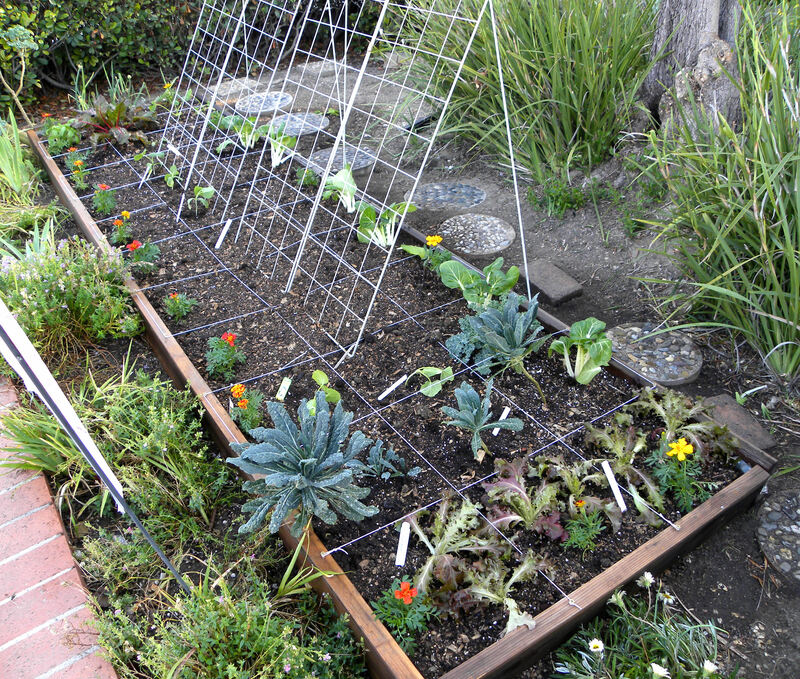 This entry was posted in Uncategorized and tagged build, cucumber trellis, Gardener's Supply Company, how to, Huntington Beach Community Garden, Orange County Conservation Corps, raised beds, vegetable garden. Bookmark the permalink. Thanks for the shout out! So glad we could provide a bit of inspiration 🙂 Everything looks wonderful and so full of promise! Great job! I hope your garden grows well now. I know how hard it is to have to water by hand. No one wants to do that on a regular basis. Hopefully your new hose will help. Daphne, I’m still watering by hand, but at least the hose reaches now and it is easier. 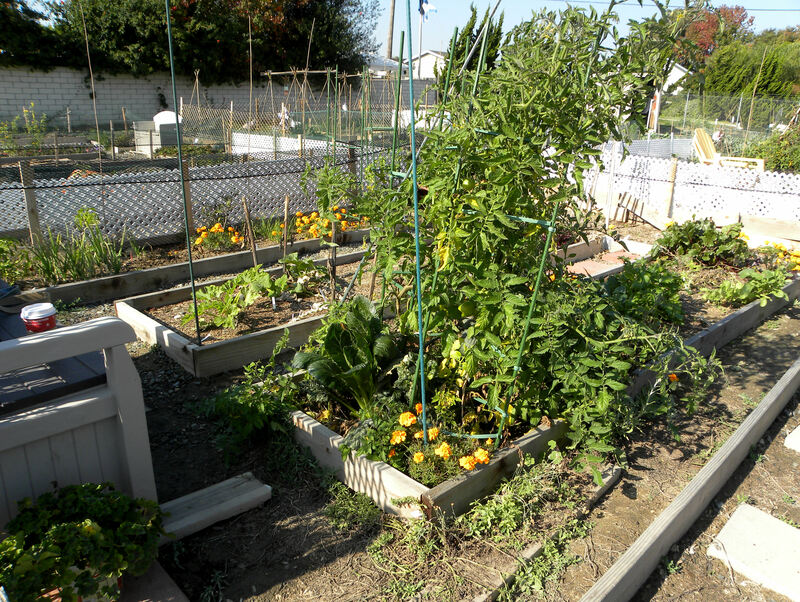 Sad to know your community garden was disallowed raised beds… but that yours found a happy home in your own garden. Neglected no more! Leduesorelle, yes, I’m happy to be able to use at least a few of the boards at home, but I still have a large pile of lumber sitting in our side yard, awaiting a new community garden closer to home that doesn’t seem to be happening. Oustanding on the beds! I have a couple you can throw together for me, if you like. That’s disappointing from SCE. Although, they’re also building massive power lines through our city regarding the Tehachapee Project with no care about who they affect, so I wouldn’t be surprised if the reason they said no raised beds is just because they can. Hey, Turling, I would love to build your garden beds for you. NOT! I was pushing my limits to build my own beds. And as for SCE, yeah. They can. So they did. There was no good reason for it. Job well done! We grannies can do wonders if we just put our minds to it. I just bought myself a new cordless drill/driver, as I have the same problem with arthritic hands. It’s such a welcome addition to my personal tool box, as my husband always forgets to recharge the batteries on his, and misplaces the drivers and bits. Thanks, Annie. Good to know that I’m not the only tool-using grannie. You have wrong information about the cranky neighbor suing the city. Did you know that the city put this garden in without notifying the homeowners that back up to that eyesore? It is a nuisance for all of us. I have had 7 sinus infections myself and my neighbors are also sick. It has taken our privacy away. It looks like you have a nice garden in your backyard, Maybe we can come over and infringe on your privacy. You don’t need decorations in your plots. Your little whirly-gig things reflect the light into our houses. Your gardeners like to leave their children unattended while they are gardening to kill the lizards and throw rocks and kick up dirt. THIS IS NOT A PLAYGROUND. We now have dust so bad in our house, we have to keep our house locked up during the day… Oh, yeah. We can’t even have people over in our backyards because of your constant work parties. So while you are put out by the rules, we are put out by your $100 dollar investment overriding our 6- to $800,000 investment. You people have no consideration for any of us. Cranky? Think about it from our end. You sound pretty cranky to me. The garden group has work parties once a month, during the morning, and I don’t see why that should prevent you from having people over. My neighbors have parties, we have parties. Sometimes on the same day. Horrors!